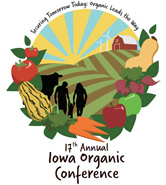 Agronomy/Horticulture Organic Program.Research and extension programs in many aspects of organic production. Agricultural Marketing Resource Center. The Ag Marketing Resource Center is anational resource for producers interested in value-added agriculture. AgMRC offers producers the ability to: investigate value-added commodities or niches, gather information on creating a business and research general market and industry trends. F.E.E.L. Field Extension Education Laboratory. A program run by ISU Extension which provides training for agribusiness personnel and others on a variety of agronomic topics. Beginning Farmer Program. This program provides information to assist beginning and retiring farmers. It includes the Farm-on program, which connects beginning farmers with retiring farmers. Iowa Manure Management Action Group (IMMAG). Provides a comprehensive clearinghouse on manure management resources and educational programs. Sustainable Agriculture Research and Education Program. ISU Extension is responsible for implementing the Sustainable Agriculture Research and Education (SARE) provisions of the 1996 Farm Bill in Iowa. Value Added Agriculture. Provides training and support for farmers and farm groups developing organic markets. Assistance in developing marketing and feasibility plans, and strategic planning is provided.